As Q3 comes to a close, 30-year fixed-rate mortgages are at their highest levels since April 2011—now averaging just above 4.7%. Even so, they are still far lower than their 30-year trendline. A 1% increase in mortgage interest rates decreases buying power by 10%. Or said differently, a 1% rate increase has the same net effect on monthly payment as a 10% increase in the sale price. That also means if prices fell 10% but rates went up 1% your payment would remain the same. This is a far bigger factor than most people consider. Both first-time and move-up home buyers, with (finally!) more homes for sale to choose from and motivated by anticipated further rate hikes nipping at their heels, will feel the urgency to get moved and settled while they can still afford to do so. Our market is likely to increasingly favor buyers as interest rates cause mortgage payments to increase uncomfortably beyond the affordability ceiling governed by personal income and wages. Properly-priced turn-key homes, and those in the most desirable settings, are still commanding very attractive prices and occasionally multiple offers. Everything else is seeing slowing appreciation and market softening. Strategic positioning, savvy marketing, and expert negotiation have never been so important as they are now. 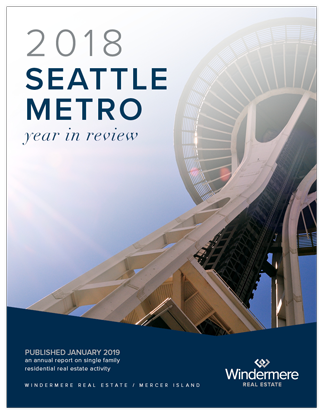 Seattle neighborhoods that were strongly bolstered by new construction and renovation saw the strongest sales activity, and not surprisingly, the greatest correlated price growth. 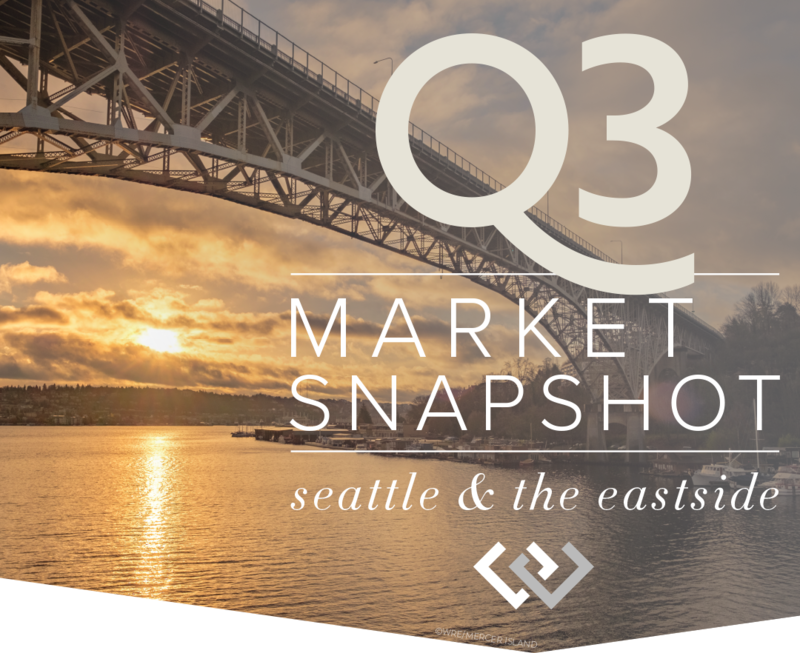 Up 16.4% Q3 over Q3, the Queen Anne/Magnolia area led the charge, followed closely by Madison Park/Capitol Hill at 15.9%. Lake Forest Park/Kenmore at 13.2% and West Seattle at 12.5% also fared very well. 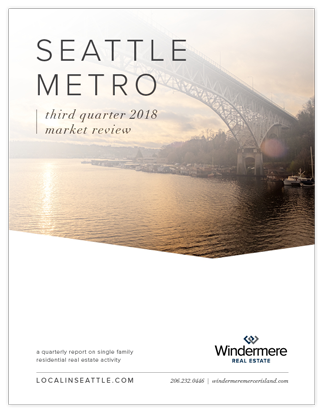 Richmond Beach/Shoreline (6.2%), Ballard/Green Lake (4%), North Seattle (3.4%), and South Seattle (0.7%) saw notable price easing and contributed to rounding Seattle out to a modest 6.3% overall Q3 2017 to Q3 2018 median price increase. 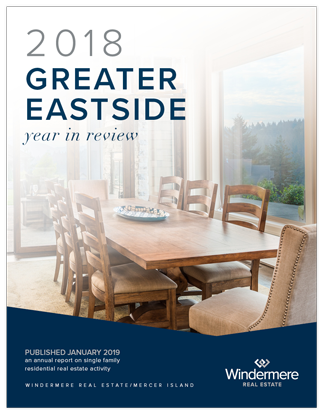 Sharp increases in the number of homes for sale coupled with fewer international buyer transactions has caused a few ripples in the Eastside real estate market. 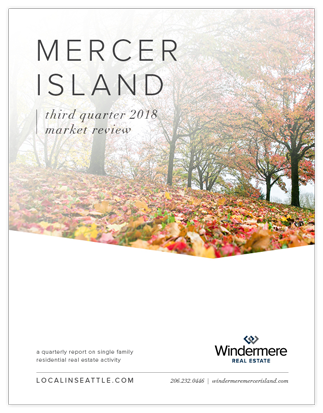 Mercer Island shows the strongest Q3 over Q3 increase in median sale price (see explanation below) at 19.7%, followed by Woodinville at 12.3% and Redmond at 12.2%. Bringing up the mid-section was West Bellevue at 8.0%, East of Lake Sammamish at 7.8%. Lagging the Eastside median increase of 7.3% were Kirkland (6.9%), South Eastside (2.0%), and East Bellevue (1.8%). The Q3 median sale price was 19.7% higher than that of Q3 2017. However, its crucial to note that Q3 of 2017 was an anomaly with many land-value sales transacting at the low end of the price spectrum. The effect was that the median sale price was 10.2% lower than Q1 of that same year. Far fewer moderately priced homes transacted in Q3 of this year. There were 89 sales in Q3 2017 and of those sales 45 were of homes priced below $1.5 million. 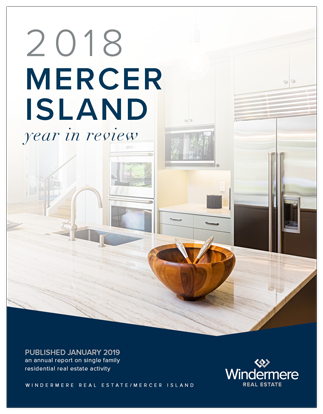 Compare that to Q3 of 2018 with 74 sales, of which only 28 were priced below $1.5 million. The differential of sales between the two years was almost entirely composed of entry-level and land value home sales. To further prove this, we looked at comparable homes sold this year and last (an approach like that of the Case-Schiller index). 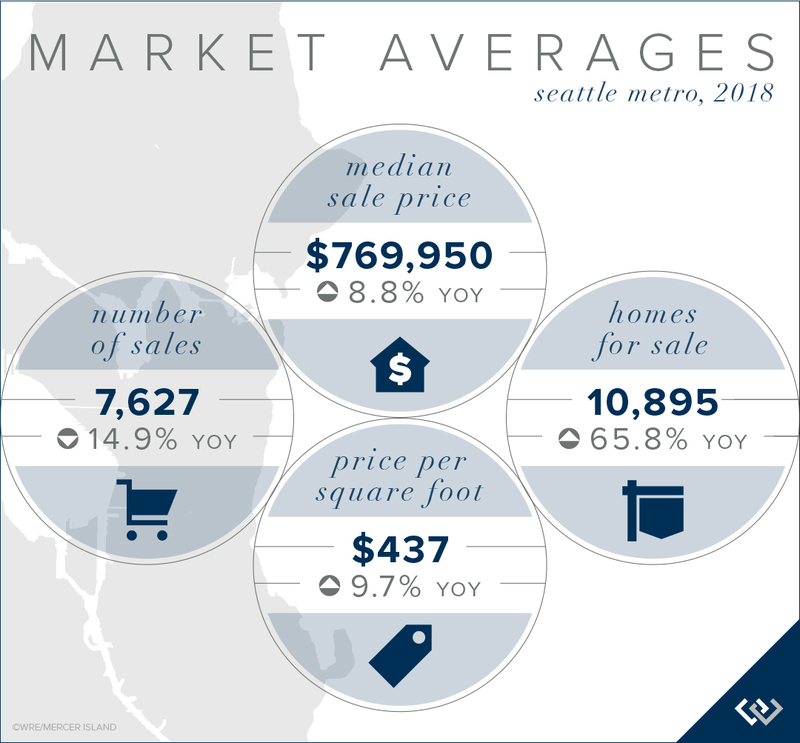 All things being roughly equal, the median sale price of that subset of homes increased only 9.0% from Q3 2017 to Q3 2018. This number is far more in alignment with what we have truly experienced in our market. 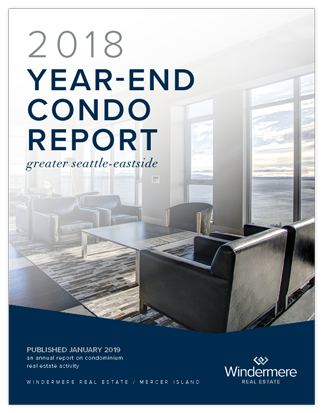 Significant new construction projects underway or announced have dampened sales of existing condos somewhat, especially where they will directly compete with the new buildings. Neighborhood safety is being weighted more carefully against urban hip now more than ever. 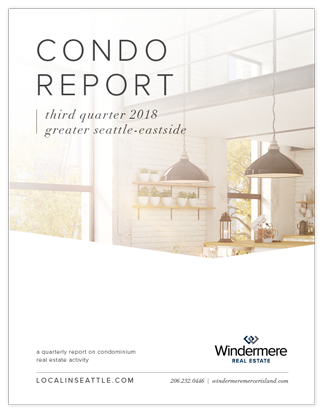 In Seattle, median sale prices of existing condos in Downtown Seattle/Belltown (-0.4%), Queen Anne/Magnolia (-4.8%), and North Seattle (-8.0%) have all decreased while surrounding areas have seen very strong to moderate Q3-Q3 increases. 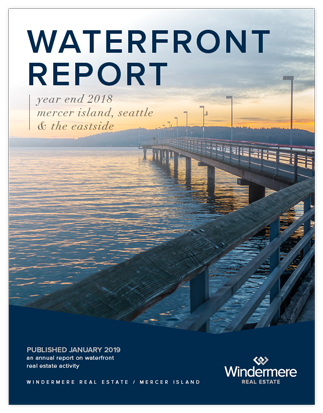 This quarter’s top contenders were Richmond Beach-Shoreline (30.3%), Ballard-Green Lake (26%), and West Seattle (25%). 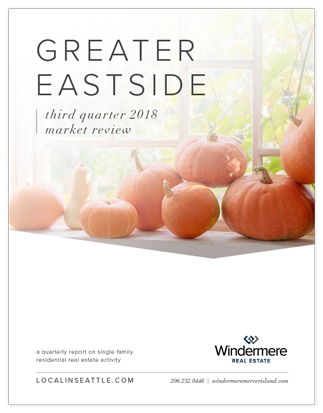 On the Eastside, all areas except South Bellevue (-9.3%) saw considerable increases in the Q3 median sale price. 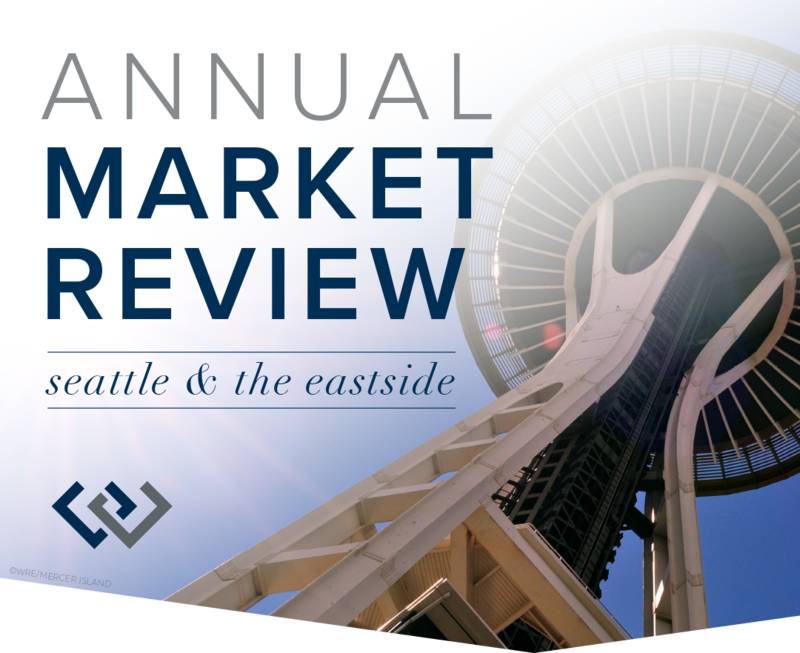 East Bellevue (37.1%), Redmond (19.1%), and Kirkland (17.6%) topped the charts. 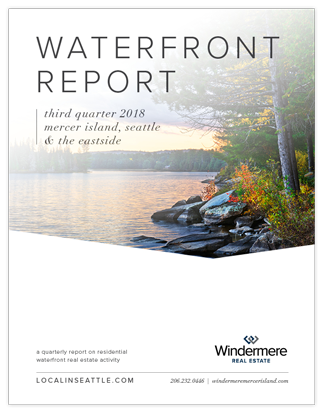 © Copyright 2018, Windermere Real Estate/Mercer Island. Information and statistics derived from Northwest Multiple Listing Service and deemed accurate but not guaranteed.